BATI Group were recently awarded the transportation of steel structures to Qatar from Turkey for the 2022 World Cup. BATI shipped a total of 80 tons and 550 cbm of steel to Qatar, helping the construction companies build and deliver the stadiums on time. The stadiums are being built in Qatar to be used during the World Cup, however, they are fully demountable and they will be gifted to Africa afterwards for further use. This is to add value to 'world football' and encourage generous acts like this world-wide. BATI's scope of work was to deliver the steel constructs from door-to-port in Qatar. 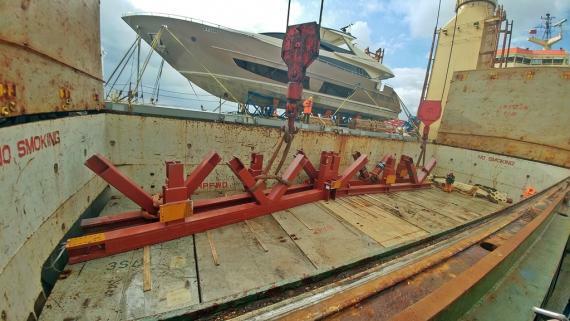 Whilst executing this project, BATI Shipping's greatest challenge was caused by a lack of proper lifting points and a poor center of gravity. As visible in the gallery below, the largest and heaviest piece of cargo - weighing 40 tons at a length of 26 meters - had no lifting points. BATI Group were forced to calculate and improvise accordingly, leading to the successful shipment of this cargo.